Facebook never lets you down. The social networking giant keeps updating its platform to keep you hooked and also to onboard new users. In a latest in the series of new launches, the Zuckerberg team has launched multi-screen group video chat on its messenger application to make you chat with multiple Facebook buddies over video calls. Video calling isn’t new to Messenger, what’s new is that you can chat with as many as 6 different users, who will all appear on your screen at once donning their Snapchat-style selfie masks. There is another update too wherein as many as 50 users can listen and talk over voice while sending text, stickers, emojis, and GIFs — basically creating a forum for holding discussions. Group video chat starts rolling out worldwide on iOS, Android, and the web, today, though Android will have to wait for the MSQRD-powered selfie masks that might not ever come to the desktop. It’s free on Wi-Fi but standard data charges will apply on cellular connections. Multi-screen group video chat gives an all-together new dimension to hanging out with friends online. It isn’t about sending and receiving a couple of messages once in a while anymore. An extended session with peers for group discussion or joint studies would be easier than ever. With 245 million people making video calls on Messenger each month, the feature is sure to take a flying start and give a tough competition to teen app sensation Houseparty, from the makers of Meerkat. 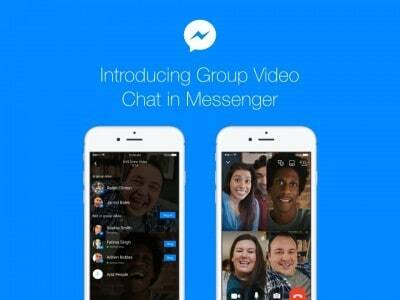 To get started, you select friends or a group text thread to invite to a video call. If there are 4 users chatting, each gets a quarter of the screen. Beyond four, the screen turns into a gallery mode with whoever is speaking taking up the bulk of the screen with little thumbnails of everyone else at the bottom. And everyone beyond the first 6 up to 50 callers will only be able to listen, speak, and send content but won’t appear in the video gallery.